Hong Kong collectible company Hot Toys has been on Kotaku a lot lately, mostly for its wonderful work on big, expensive figures based on the Chris Nolan's third and final Batman movie, Dark Knight Rises. Today, though, we're turning back to that other comic book blockbuster of the year, The Avengers. 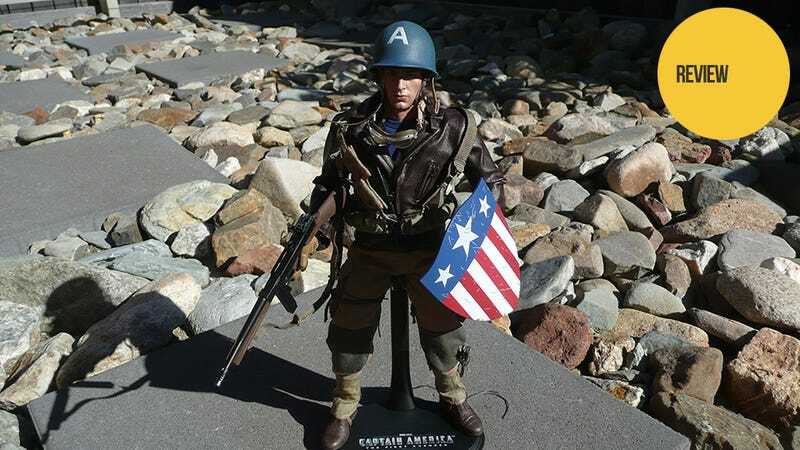 Actually, we're turning back even further, because this Captain America figure is from the Captain America movie, and depicts Steve Rogers as he first appears in action in the 1940s, before he goes out and gets a better suit. Like most Hot Toys pieces, it comes with a ton of gear, including multiple weapons, interchangeable fists, a prototype shield, two helmets (they stack on top of each other), goggles, bandolier...yeah, a lot of stuff. As you can see in the gallery below, the craftsmanship on his uniform and equipment is amazing. What looks good in promo stills is even more impressive in the flesh, as those pockets on his pants actually open, and the bandolier is attached with clips so tiny you wonder how they were even made. Even the bolt on his Thompson slides up and down. If you ever wonder why these things cost in excess of $200, this is why. There's attention to detail everywhere you look, from the scuffed tip of his helmet (which is actually made of metal) to the eyelets of his boots. Because, yeah, his boots have actual eyelets. Sadly, not everything is perfect. While most of the company's figures we've seen lately look identical to their real-life counterparts, this one...doesn't. There's a resemblance from certain angles, but it's a little disappointing that perhaps the most important likeness the figure needed to nail is the one it couldn't quite manage. The figure costs $220, and is out now. You can buy one at the link below.